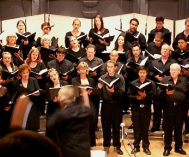 Sing for America’s primary strategy is to use the arts to fund the arts – raising money through member –supported, volunteer–performed benefit concerts. The premiere performance will be April 17 in San Francisco’s historic Herbst Theater. In exchange for world–class choral training and fundraising support, SFA members help raise money to support the musical arts in our communities. SFA helps people raise funds through singing. Members of SFA can choose an Arts program so that half of the money raised through ticket sales and contributions goes directly to that organization.